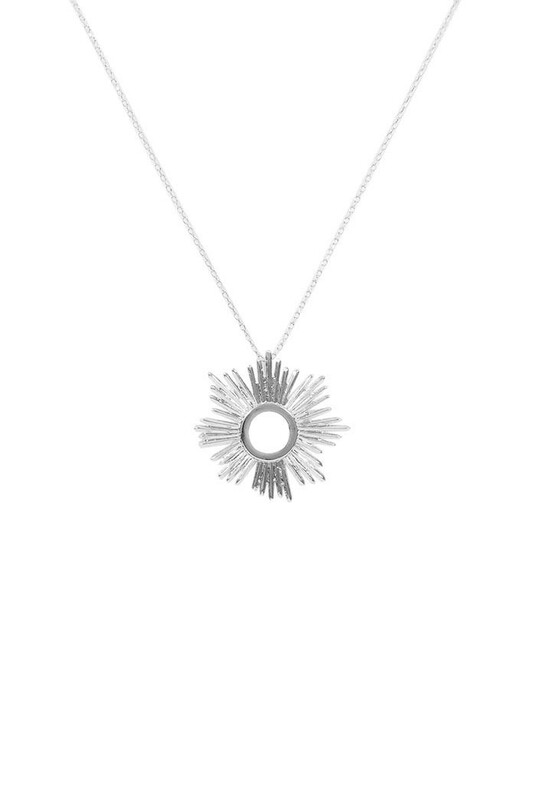 Add some glam grandeur to your outfit with this stunning Large Silver Sunburst Necklace! It's certainly one to show off at an opulent event or Gatsby themed party and really makes a striking style statement. Try pairing this pretty sun necklace with a chic tasselled flapper and studded silver stilettos for a beautiful baddass 1920s look this party season. You can also turn things down and keep it low-key with a lush LBD for a flicker of flair. This is a silver toned metal necklace set in shimmery shining sun design with central cut out section, rays of silver in layered levels and various lengths, held on a delicate silver tone metal link chain.